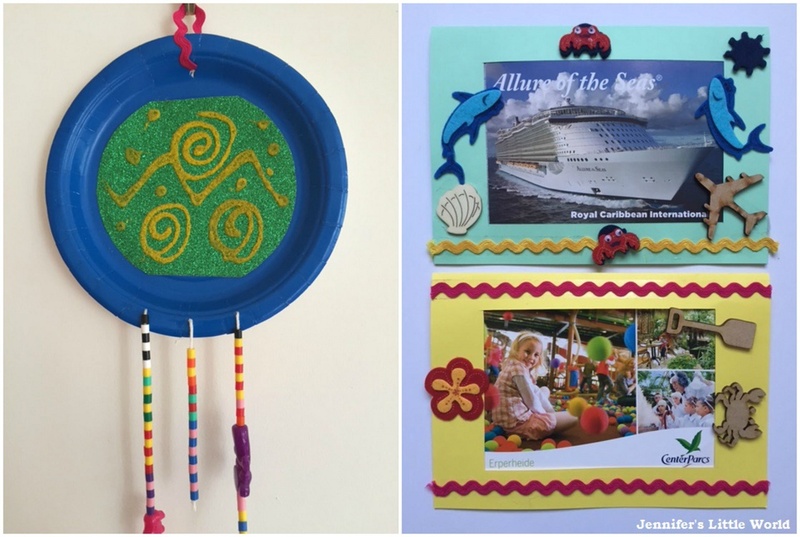 This month, appropriately enough, the theme for my Bostik Bloggers craft box was Holidays. It was another fantastic crafty box, and we came up with two crafts using the materials and Bostik products inside - some simple frames to display holiday photographs or postcards and some paper plate hanging decorations featuring beads and sand art. Our first craft was some frames for postcards. 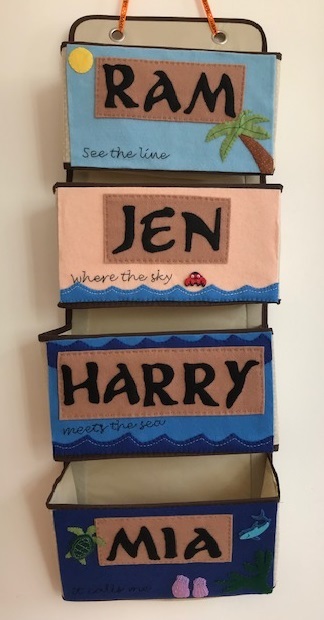 I always try to buy the children a postcard when we go on holiday somewhere as a little memento for them, especially as we hardly even seem to print out our digital photographs. We made some simple frames for them to display one of their favourites. You just take an A4 sheet of coloured cardboard. Fold it in half, and on the inside draw around your postcard or photograph. Use a craft knife to cut out the hole, making it slightly smaller than the opening that you have drawn. 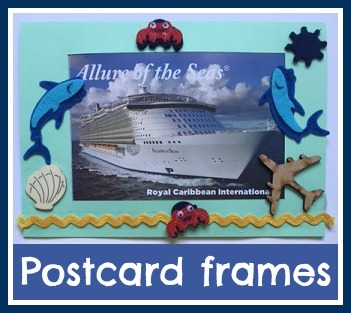 Decorate the front of the frame - we used ric rac, stickers and wooden decorations. 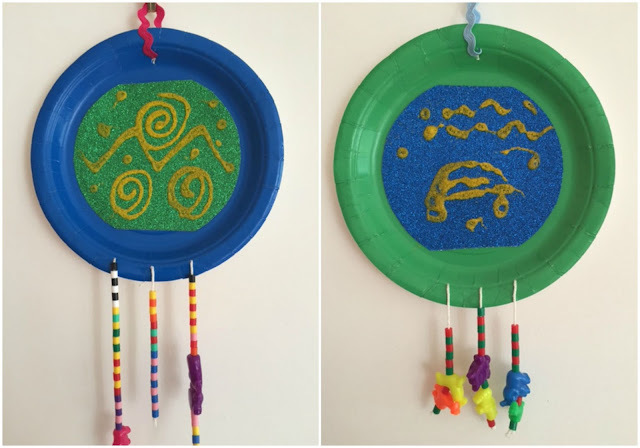 To stick down the wooden decorations we used Bostik glu dots which we received in a previous Bostik Bloggers craft box, they are very sticky and great for holding larger decorations firmly in place. The stickers were self adhesive but we made sure that they were firmly stuck with the fine and wide glu pen. We finished the frames by taping the postcards in place and glueing around the edges of the frame. Then the children used some blu tack to stick them up in their bedrooms. Then we used some of the extra materials to make some hanging decorations. To begin with, I cut out some glittered card to fit inside the paper plates and glued it firmly in place using the Bostik fine & wide glu pen. It's a great idea - the glue is stored in the centre of the pen and then there is a fine nib one one side and a larger, soft nib on the other side, and you can choose which to use depending on how accurate you need your glueing to be. I used the wide nib to glue the glitter card to the plate, then we used the fine nib to trace out some patterns to be covered in coloured sand. The glue pen was really easy for little ones to use, and although I helped Mia, Harry was able to draw out his own picture. Then we sprinkled gorgeous yellow sand over the design and shook off the excess leaving our patterns behind. Regular readers will know that I'm a huge fan of Hama beads, and I was delighted to find some inside our box this month. But this time I decided to try something we've not actually done before and use them for threading - and I really like how they look! Both children were able to thread the Hama beads onto some wool using a thick needle, along with some of these lovely plastic animal beads. I used some coloured ric rac to make hanging loops, then I threaded the beaded strings through the bottom of the plate. I think they make lovely colourful decorations for their bedrooms, they remind me a little bit of dreamcatchers! There is plenty of coloured sand left over and the glue worked perfectly with it so I think that's it is a craft we'll be trying again.